In 1755, British soldiers rounded up French colonists in Acadia, Canada, and put them on ships bound for American colonies. According to legend, the forced deportation took place on one couple's wedding day. Evangeline and Gabriel were put on separate ships and spent their lives searching for each other. With its dramatic ending, Longfellow's poem Evangeline was a popular subject for silent movies in the 20's. Our Evangeline consists of five movements/sections: Pastoral, Celebration, Chaos, Searching, and Finale. Visuals create the atmosphere, music evokes the feeling, and selected text from Longfellow's epic poem, conveys the narrative. Words replace actors and music becomes dialogue. This is "the forest primeval" in a world of fire, water, airplanes, freeways and Madison Square Park. 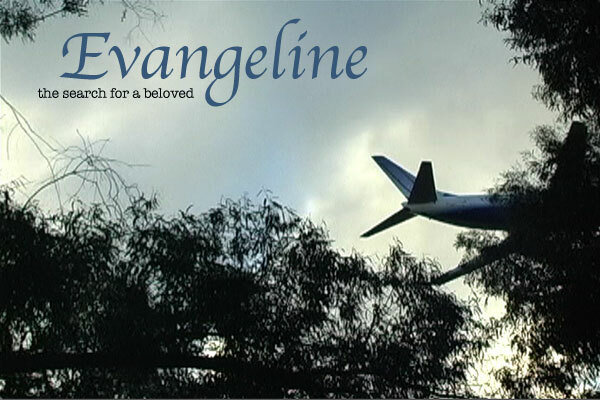 Evangeline is about both the search for a beloved - who you don't know if you will ever find in this lifetime - and about the devastation political acts bring on the lives of individuals. Viewing link and password upon email request.